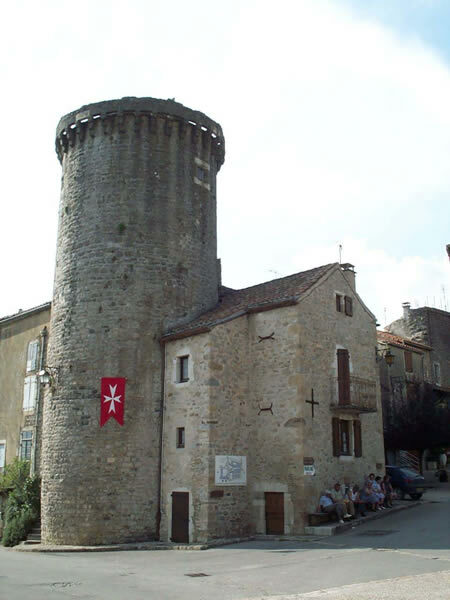 Sainte-Eulalie de Cernon, one of most preserved templar commandery. Sainte-Eulalie de Cernon is one of most preserved templar commandery.Like others fortified places on the Larzac Plateau the village has kept preserved medieval ambiance that one’s feel walking in its little streets. It’s mainly due to Jean de Bernuy-Villeneuve who, in the 17th century modernized the former templar commandery. This fortified village has all its towers. It was the most important templar commandery in the south of France. After the fall of Templars, the commandery belonged to the Knights of Saint John of Jerusalem. They built the towers and the walls during the Hundred Years War, after that a panic was triggered by a horde of mercenaries who invaded one of the castle of the Knights. The Templar church overlooked a nice square enhanced by a nice fountain. See the main stairs, the frescos represent the christian virtues, Charity, Hope, Faith.